RBTH presents a selection of views from leading Russian media on international events, featuring reports on a telephone discussion held by the leaders of Russia, Ukraine, Germany and France on resolving the impasse in eastern Ukraine, the first session of the Ukraine-EU Association Council in Kiev, and a preview of a two-day meeting of the European Council in Brussels, with analysis of the implications for Russia. The Moskovsky Komsomolets tabloid newspaper writes that Russian President Vladimir Putin, German Chancellor Angela Merkel, French President Francois Hollande and Ukrainian President Petro Poroshenko have held a telephone conversation in which they discussed the situation in the Donbass region of eastern Ukraine, which has been riven by conflict since pro-autonomy militias seized government buildings and proclaimed two breakaway republics in the region, allegedly with Russian military support. Citing the Kremlin's press office, the newspaper reports that in the course of the conversation “the necessity of immediately implementing a sturdy ceasefire in the Donbass was emphasized.” Moreover, the discussion also touched upon the importance of holding a session of the contact group as soon as possible in order to realize the Minsk peace agreements and establish a dialogue between Kiev and eastern Ukraine. The leaders named "the exchange of forcibly held individuals and the removal of heavy weaponry from the line of conflict by both sides" among the priorities of this dialogue. Moskovsky Komsomolets adds that the sides also examined the issues of economically restoring the damaged regions and offering the population humanitarian and social assistance. Putin, Merkel, Poroshenko and Hollande agreed to regularly hold telephone conversations in the future. The newspaper reminds its readers that the new truce between the militias and Ukrainian government forces with OSCE mediation began in eastern Ukraine on Dec. 9. The ceasefire is expected to be followed by a new round of negotiations within the contact group in Minsk, but the date of the meeting has still not been determined. In the last few days the date has changed at least three times. Expert notes that today Ukraine needs financial help, not declarations of non-visa policies, since the EU and IMF credit to the country is proving to be insufficient. The magazine writes that Kiev needs the resources in the upcoming weeks, otherwise Ukraine will have to announce a default. In turn, the EU is demanding that Kiev first show the effectiveness of its new government. “I do not doubt that the government has a good reform package, but I need concrete results, not just promises,” the magazine cites Johannes Hahn, European Commissioner for European Neighborhood Policy and Enlargement Negotiations. In his words, the decision to allot Ukraine additional financial assistance depends directly on the achievement of concrete results. For this reason, the Ukrainian government has no choice but to start the implementation of reforms, emphasizes Expert. However, the problem is that to do this the country needs political will, as well as the willingness of the population to tolerate hardships, which, it seems, Ukrainians don't have. It is therefore possible that Ukrainian Prime Minister Arseniy Yatsenyuk's attempts to implement the reforms demanded by the EU and drastically reduce government spending will lead to a social explosion and another Maidan, concludes the magazine. The centrist Nezavisimaya Gazeta newspaper published an article on the eve of a two-day meeting of the European Council in Brussels. The newspaper remarks that the moods of the member countries are not unambiguous. Kiev is insistently trying to advance - as its agenda - its claims to Moscow, as well as urgent demands for a 15-million-euro bailout to avoid a default. Nezavisimaya Gazeta reminds its readers that this was the motive behind Ukrainian Prime Minister Arseniy Yatsenyuk's meetings with European Council President Donald Tusk and European Commissioner for European Neighborhood Policy and Enlargement Negotiations Johannes Hahn. The subject was also echoed in the recent meeting between Ukrainian Foreign Minister Pavel Klimkin and the Group of Friends of Ukraine (which includes European Parliament representatives of several ex-Soviet states, as well as Belgium, Denmark, Finland, Ireland and Malta). Moreover, the newspaper stresses that on the eve of the EU meeting Angela Merkel spoke in favor of relations with Moscow. 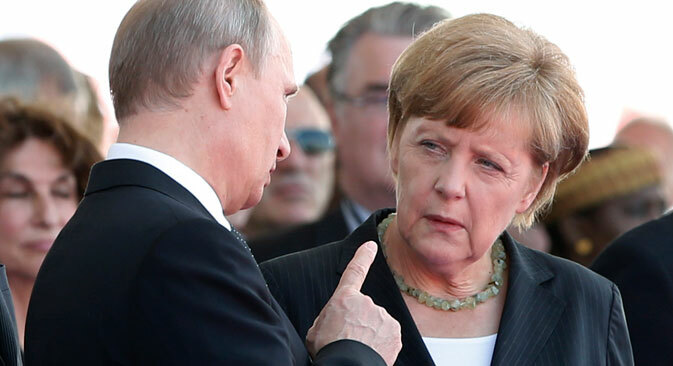 "I believe that in this period we should demonstrate the reliability of our economic relations with Russia, despite the various differences," said Merkel.